Undated Photo, Richmond, ON. From the Spring 1905 issue of the Queen’s Quarterly. (Reproduced with permission). 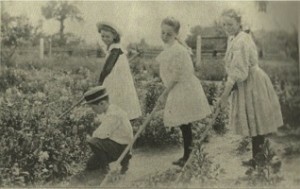 A school garden in Bowesville, Ontario established by the Mcdonald-Robertson movement, from the Spring 1905 issue of the Queen’s Quarterly. (Reproduced with permission). A sample of Canadian headlines about school gardens from the past few months: A two-year school garden project in Vancouver will contribute to fresher produce in the cafeteria and food literacy skills. Students at an ethnically diverse school in Windsor, Ontario will use a new community garden as a “living classroom” for discussions on healthy eating and plant science. Students went to work planting at a school in Pickering, Ontario that has been named ‘the greenest school on earth’. School gardens have made a recent comeback, tapping into environmental consciousness and community-mindedness. But their roots belong to a much earlier period, when they appeared to offer a grab bag of pedagogical benefits. But beyond these virtues, school gardens were also linked to the broader educational good that was experiential learning. This was learning by doing and discovery, led by the pupil. It was to be child-centred, at least in its ideal form. In the 19th century educational reformers promoted the idea that tactile engagement with objects of daily life quickened the eye and the hand while offering a more direct way for children to uncover their own skills and interests and to discover how to learn. The learning stimulated by the outdoor work would at any rate be superior to learning methods that relied heavily on rote and recitation. The other primary pedagogical benefit was nature study, which prepared the ground for the modern elementary science curriculum. Teachers already had opportunities to introduce nature study first-hand through activities such as wilderness trips or tree-planting on Arbor Day. The idea of school gardening took this one step further. Established on a plot of land adjacent or close to the school, the school garden gave children the opportunity to observe plants from seeding to harvest. School gardening flourished in cities and towns in Europe after the mid-19th century and didn’t take off in North America until the 1890s and the early years of the 20th century. 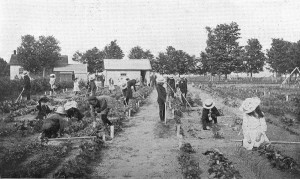 In Canada the movement (1900-1913) led by Sir William Macdonald, benefactor of McGill University, and James Robertson, future chair of the federal Royal Commission on Industrial Training and Technical Education (1910) was pivotal to school gardening . Neil Sutherland has written that the Macdonald-Robertson movement “gave practical demonstrations of such elements of the ‘new’ education as manual training, school gardening, nature study, domestic science, consolidated schools, and better methods of training teachers”. In 1903-1904, Robertson sent a group of eight teachers with experience in rural schools on study tours and they returned home to establish model school gardens, five each in Ontario, Quebec, New Brunswick, Nova Scotia, and P.E.I. School gardening gained supporters during this time because it was versatile; a variety of learning objectives could be fashioned around it. For a great many school subjects — crop science, floriculture, entomology, measurement, drawing — some of what you needed to teach that subject could be found in school gardens. There was a sense that agriculture needed to be taught early in order to encourage an interest in farming in a new generation. The rural economy was a national concern. An important thrust of school gardens was therefore about instilling a love of agriculture. Without school gardens, the The Canadian Horticulturist mused, the “child’s mind” is dulled “to the beauties about him and creates the longing for the ‘real’ life of the city. Under the direction of the school teacher, new interest in the wonders of the country life can be aroused through the medium of the school garden”. In Canada the hope that basic horticultural instruction could effectively translate into fostering a more positive view of rural life now appeared highly unrealistic. The 1921 Census indicated that a majority of Canadian residents now lived in urban centres. It was becoming harder to see a clear connection between public school gardening and preserving agricultural ways of life. Today, school gardens are back, and needed more than ever. But emphasizing their “nation building” and rural-making aspects is no longer the habit. School gardening is now more likely to be used to teach environmental awareness and issues related to healthy eating, food waste and food aid. The lenses held up to these issues are local and global. But the new school gardens also have their basic roots in the primary educational values of nature study and experiential learning that have stood the test of time. The pioneers of school gardening would be proud. Historically, the strength of school gardens has been in ideas and values we attached to them. The labour that goes into maintaining them has frequently been underestimated. But our enthusiasms for them are perennial. Conrad McCallum is completing a Master’s degree in Education at the University of Ottawa. Schwab, Erasmus. (1879) The school garden: Being a practical contribution to the subject of education. Trans. Mary Tyler Peabody Mann. New York: M. L. Holbrook & co.
“The Social Development of the Children in the School.” (1916). The Western School Journal, Vol. 9, No. 5, May, 1916, 197. Sutherland, Neil. (2000). Children in English-Canadian Society: Framing the Twentieth-Century Consensus. Waterloo, Ont. : Wilfrid Laurier University Press, 182-201. Cited in Kohlstedt, Sally Gregory. (2008) “‘A Better Crop of Boys and Girls’: The School Gardening Movement, 1890-1920. History of Education Quarterly, 48, 1, p. 58. See John Dewey, The Middle Works, 1899–1901, ed. JoAnn Boydon, 1 (Carbondale: Southern Illinois University Press, 1976), 33–35. “School Gardens”(1914).The Canadian Horticulturalist, 37, 8, 201. Ambrose, Linda. (2004) “’Better and Happier Men and Women’: The Agricultural Instruction Act, 1913-1924.” Historical Studies in Education, 16, 2, 257-85. Axelrod, Paul (1997). The Promise of Schooling: Education in Canada, 1800-1914. Toronto: University of Toronto Press, 115. Thank you for the article, Conrad. My mother attended the Macdonald Consolidated School in Guelph in the mid-to-late 1920s. Having read your article, I wonder how much gardening instruction Mac Institute (and other domestic science school) students were receiving by the 1920s. If it was a significant amount, perhaps it was an instance of post-secondary replacing elementary education as the locus for garden-centred learning, but for the purpose, not of agriculture, but of homemaking by a generation of women many of whom (like my mother, who earned a Mac homemaker diploma in 1937) would go on to organize mid-century urban households. Hi Russ, thank you for the warm comment and recollection. Very interesting to hear that your mother attended the Macdonald Consolidated School and later the Mac Institute. Perhaps there is a good reference looking at how the domestic science curriculum, and gardening’s role in it, might have evolved over the decades. For the Mac Institute, a lot of the literature does tend to focus on the period up until the 1920s. James Snell’s book on the Mac Institute, which you are probably familiar with, includes a photo of a large instructional garden on the school’s grounds, but it dates from 1915. A paper by Mary Margaret Wilson – “Higher education for rural homemakers” – looked at the first 2 decades of the 20th century. More powerful and impressive than any of the literature, of course, is your own personal connection to this history.